A man prays in the portico during mass at Sacred Heart's Church in Hwambi. The sanctuary was filled to overflowing and a few people joined the mass in the church's portico. 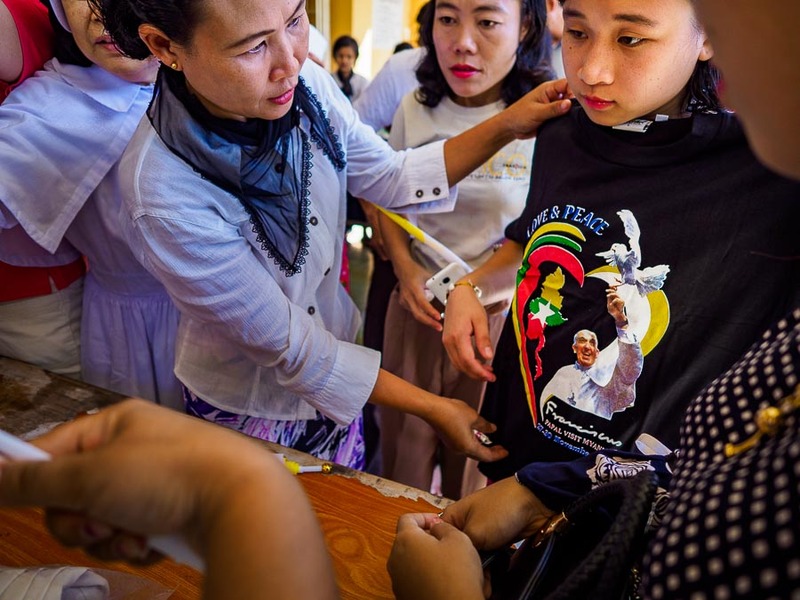 I wanted to photograph a mass in rural Myanmar as a part of my package on the Pope's visit to the country so I went out to the church in Hwambi (sort of pronounced "moby"). I wanted to get out of Yangon because I was afraid the churches in town would be swamped with foreigners and journalists doing the same thing I was - seeing Burmese Catholicism on the eve of a historic moment. Hwambi, about two hours from downtown Yangon, was a good choice. I was the only foreigner there and the priests and their congregation were very welcoming. I got out to the church about 6.30AM for an 8AM service, I like to get to events like religious services early enough to talk to officiants and make sure it's okay to photograph. 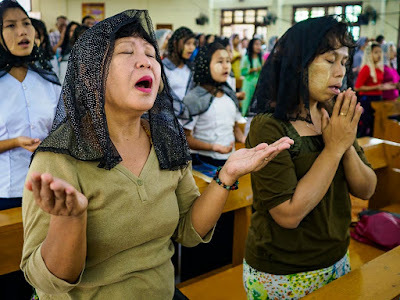 I explained to the priests that I was working on a package about the Pope's visit, asked if I could photograph mass and they told me I was free to do whatever I needed to do. Then they offered me a traditional Burmese breakfast of mohinga, a relatively mild (compared to Thai curries) fish curry. 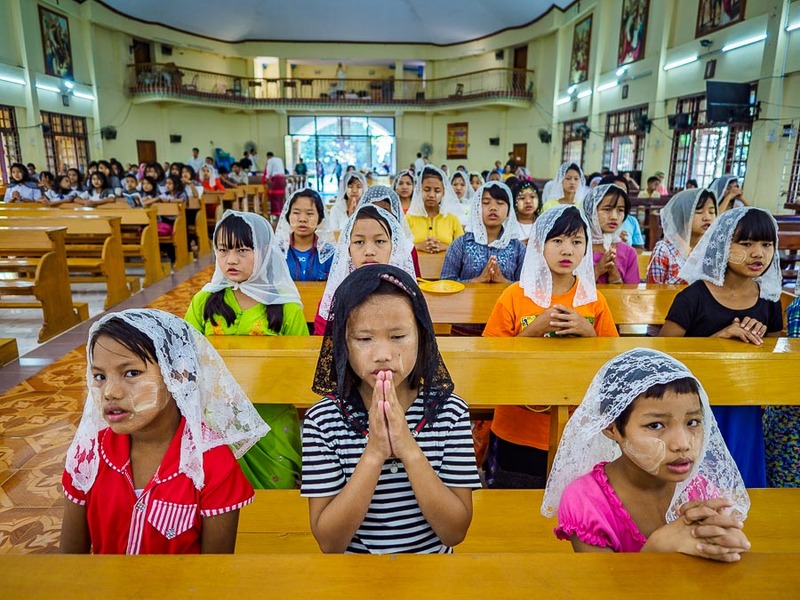 Girls pray before mass. 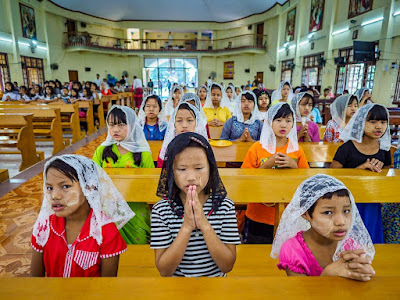 Burmese girls and women still wear veils to mass. 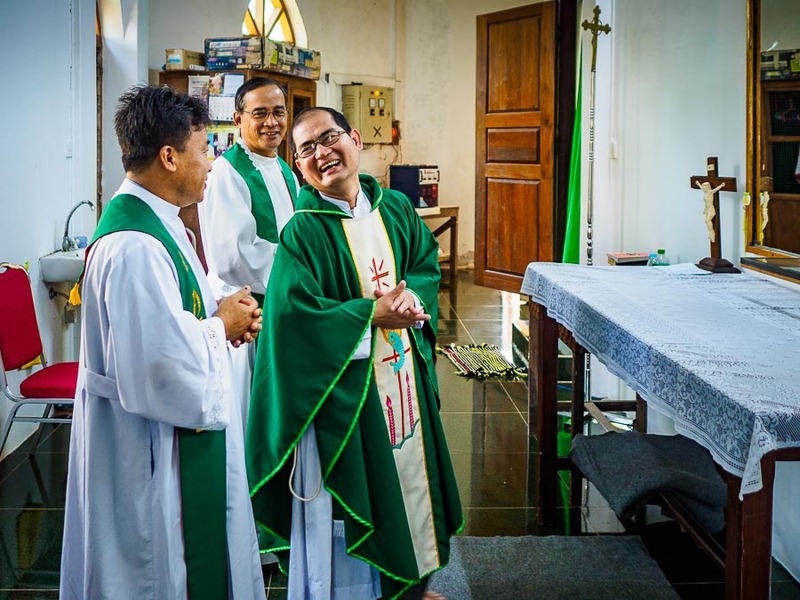 Priests get ready for mass in the vestry behind the sanctuary. People started arriving for 8AM mass about 7.15. Some went to confession, some sat or kneeled quietly in the pews and prayed. 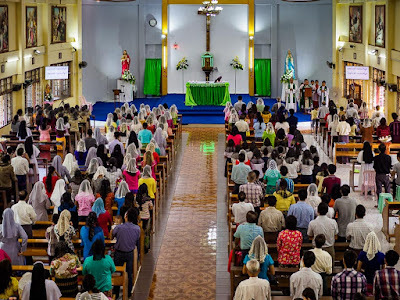 By the time mass started, the sanctuary was completely full, with more than 500 people in the church. The priests told me that this was a normal Sunday attendance. 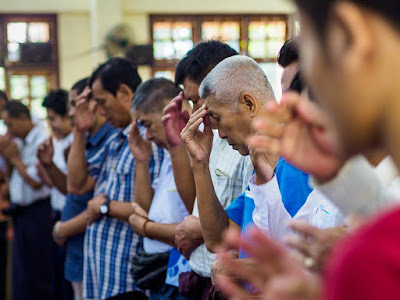 Men make the sign of the cross during mass. It's traditional Southeast Asia to remove one's shoes before entering a temple or a home. In Thailand, Catholics leave their shoes on when going into a church but Buddhists, Hindus and Muslims take their shoes off when going into a house of worship. 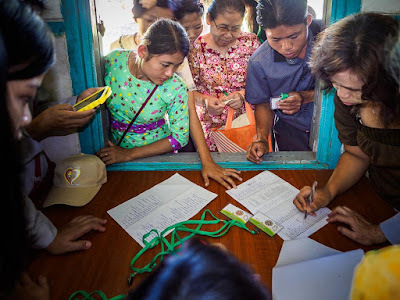 In Myanmar, Catholics, like Buddhists, Hindus and Muslims, take their shoes off and the doors to the sanctuary were lined with footwear. The mass itself was just like a mass in the US or Europe or Mexico, except that it was considerably longer than a mass in the US. It seems that priests in the US try to get people in and out and most masses run about 50 minutes, maybe a little longer depending on the number of people who take communion. (A Mexican priest once told me he didn't understand the American mania for a fast mass.) The homily was longer than a homily in the US (or maybe it just seemed longer because I don't understand Burmese) and almost every adult at mass took communion. It didn't end until about 9.30. 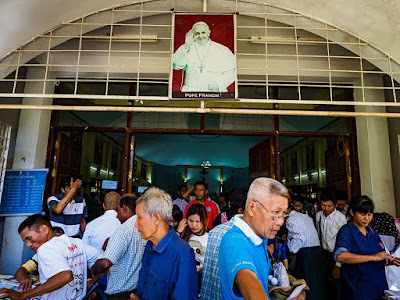 Then people gathered to socialize, buy Pope memorabilia and get their tickets for the papal mass. Most didn't leave the church until about 11, many people were at the church from 7.15 until after 11, pretty much unheard of for a Catholic church in the US. Parishioners leave the church after mass. A portrait of Pope Francis hangs over the door. People bought Papal merchandise after the mass. 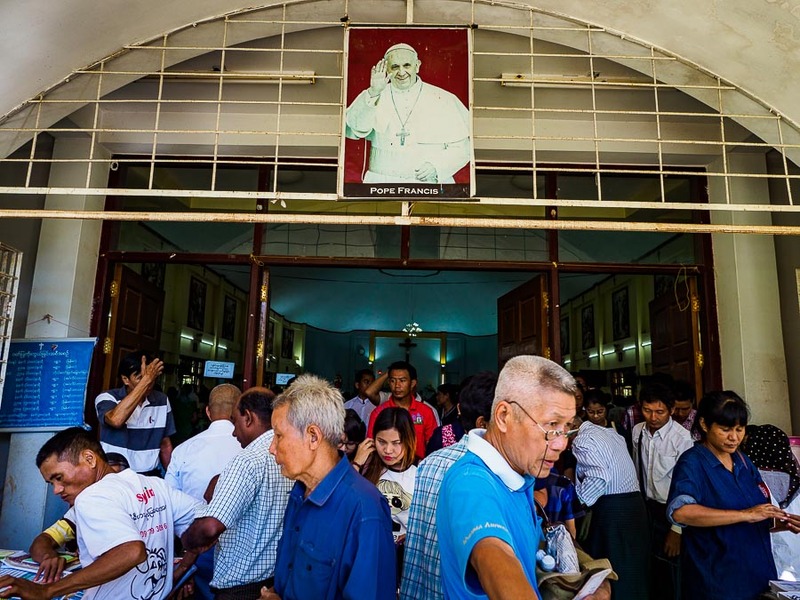 Nearly every member of the church got in line for tickets for the Papal mass in Yangon. There are more photos from mass in Hwambi in my archive or available from ZUMA Press.